The DaRi system is a world first and fulfils all typical requirements for a properly functioning leaf guard system. They are manufactured from recyclable polypropylene. 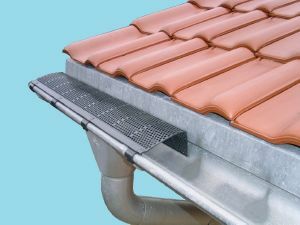 The system is purpose made for copper, zinc, stainless steel and aluminium beaded type half round and box gutters. The leaf guards are thermally stable form -20 degC to 100 degC and UV stable. Each component is 760mm in length and weighs around 160g. A special feature of the DaRi system is the front-sloping hexagonal mesh. This provides the largest possible open area and therefore an extremely high average flow rate. 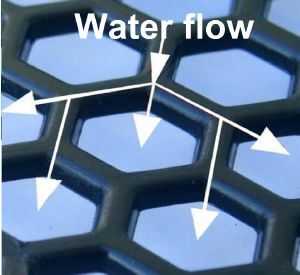 The water which flows along the structure of the system component is always channelled directly into one of the hexagonal holes(see detailed view).